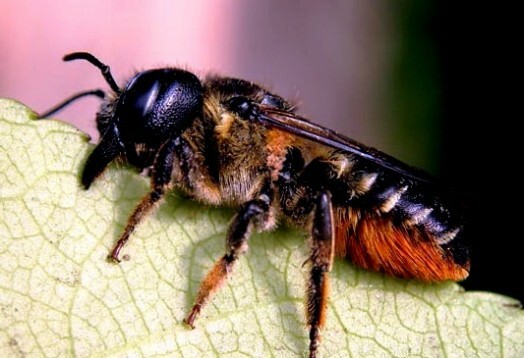 Leaf-cutter bee is a medium sized insect with the length of 9-13 mm (1”). 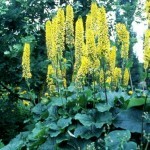 It can be found in gardens, forest glades and edges. 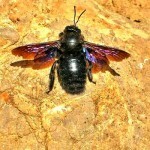 It resembles honey bees, but it is darker and has more rounded belly, and it is a a single insect. 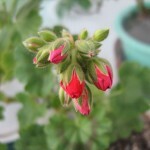 It collects flower nectar and pollen. Bee eats very quickly – it can visit 25 flowers for one minute. Sucking nectar, it unwittingly collects pollen and transfers it to another flower. Thus, this insect pollinates a large number of plants. 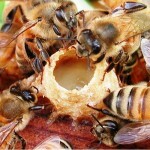 It build nests is in a variety of ready-made cavities (such as abandoned burrows of ground bees). Construction of single-cell lasts about 2.5 hours. The largest nest of leaf-cutter bee has 17 cells. It needs over 1,000 pieces of leaves to build the nest. 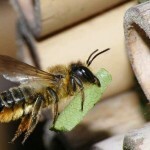 The finished leaf-cutter bee nest is a long cylinder, you can easily break it up into separate cells. 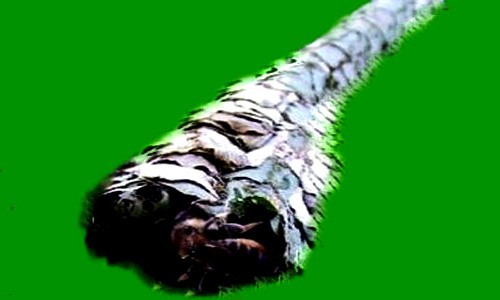 The leaves are not attached, so the newly constructed nest, extracted from the course, is easy to parse. Later, it is less easy, because larva produces gaps between the pieces of leaves with sticky liquid, which, freezing, holds them together. In the beginning the leaf-cutter bee puts in each cell food, consisting of a mixture of nectar and pollen. Then, bee lays eggs and seals them. Larvae have enough food until the next spring, when they open the cocoon. Females appear from fertilized eggs, they grow in the nest, and from unfertilized eggs – males, which grow outside the nest. 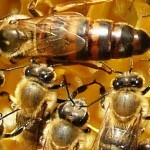 Bee males appear first in spring and compete for females. Soon after fertilization drones die, and the female painstakingly builds a nest for the next 2 weeks. To fill it with food, the bee need to work for about 5 hours. Leaf-cutter bee builds its nest until death. It chooses the appropriate finished cavity – abandoned burrow of bees or earthworm burrows, the bee begins to fill it with carelessly cut pieces of rough leaves of oak, grapes, hawthorn. This plug is used to protect the nest. Once the plug is made, the bee begins to cut oval slices from more tender leaves of lilac, acacia, rose. Sitting on the leaf, it carefully “cuts” it, starting from the edge and slowly turns around. In the beginning,it makes of the large leaves, covering about a third of the circumference of the channel, the outer layer of the cell, so that the pieces are connected, and their lower ends are bent to form the bottom of the cell. After that, it closes the gaps remaining between the first pieces, and thickening the walls with small pieces of leaves . In order to seal the cell with food, a bee cuts perfectly round pieces of leaves. Moreover, the diameter of the first is exactly equal to the diameter of the cell and the subsequent pieces are larger and are concave inward, forming the bottom of the next cell. Some people found cutter-bees on balcony outside in very low temperatures.